American Express released boosted sign up bonuses for their premium AeroplanPlus cards today. Both the Reserve and the Platinum cards see a 10,000 Aeroplan Mile increase to 60,000 and 50,000 miles respectively. Both of these offers run until Mar 29, 17. • New American Express® AeroplanPlus®* Reserve Cardmembers earn 60,000 Welcome Bonus Aeroplan®* Miles after you spend $3,000 in your first three months of Card membership. Offer ends on March 29th, 2017. Apply now. 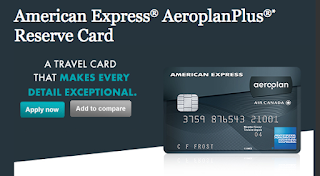 • New American Express® AeroplanPlus®* Platinum Cardmembers earn 50,000 Bonus Aeroplan®* Miles after you spend $1,000 in your first three months of Card membership. Offer ends on March 29th, 2017. Apply now. • Go confidently with coverage that’s as broad as your horizons, including Car Rental Theft and Damage Insurance, Emergency Medical Insurance (out of province/country), and much more. • *As a Charge Card, the balance must always be paid in full each month. 30% annual interest rate applies to balances not paid in full.